All children feel fearful from time to time. A certain amount of fear is perfectly natural for people of all ages, but kids, who don't yet have the life experience to understand that many fears are irrational, may experience considerably more fear than adults. As long as their children's worries and anxieties don't become so extreme as to be a source of constant preoccupation, parents can usually rest assured that their kids will outgrow their fears. The things and situations that make children anxious tend to vary from age to age. As they mature and gain confidence in themselves and their place in the world, most children leave behind many of their early fears. This growth process continues all throughout childhood, with kids transitioning through their fears in much the same way that they outgrow toys (and clothes!). Toddlers often experience some level of separation anxiety and may fear baths, animals (both wild animals and boisterous pets), noises, strangers, and the potty. Some of these fears may continue into the preschool years, especially the fear of animals, but many of the others are replaced by fears of imaginary things, such as monsters and ghosts. This is the age when many parents find themselves rushing to their children's bedsides to offer comfort after the child had a frightening dream or to show children that nothing is lurking beneath their beds or in their closets. Kids this age may develop fears about bedtime or darkness, and may appreciate having a small nightlight placed in their sleeping areas. As their worlds expand and kids are exposed to new experiences, additional fears may crop up. Starting school or changing schools can be quite stressful for some children, who may fear that teachers will not like them or that they will not fit in well with peers. Additionally, school aged kids are beginning to process information about the wide world, and may feel anxious about war, crime, and issues of personal safety. By the time that they are teens, few children are still experiencing the fears of their early childhood, but their growing knowledge of the world around them may increase anxieties about crime, war, and safety. They may have also experienced the death of someone close by this age, increasing the chances that they will worry about the possibility of their own death or the death of a parent. Social issues also take on great importance to teens, so fears of social rejection can be common. Knowing that they will be expected to take on full responsibility for their lives in just a few short years can be overwhelming for some teens, who may fear that they won't be capable or successful at university and in life. Parents instinctively provide comfort and reassurance to babies and young children when the kids feel fearful, but may not know how to best respond to the fears and anxieties of older kids and teens. Children of all ages benefit from knowing that their parents care about their feelings, though, so parents shouldn't hesitate to offer a wiling ear and words of reassurance when their kids are afraid. Often, older kids' and teens' worries mimic those of adults - let's face it, everyone feels anxious at some point - and it can really help for kids to know that their feelings are perfectly natural. Stressful times can increase fearful feelings in kids and can even prompt the development of new fears. When parents separate or divorce, kids are likely to suffer at least some insecurity, but parents can help by assuring the kids that they will continue to be loved and cared for by both of their parents. Illness and death, especially when close to home, can make kids of all ages feel anxious; fearful that they or someone else they love may fall ill or die. While parents cannot offer guarantees of complete health and safety, they can listen to their children's worries and give honest, thoughtful information regarding the current situation and the unlikelihood of additional misfortune. 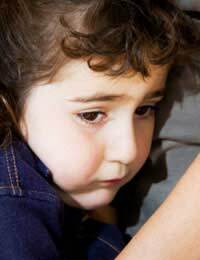 While some fear is normal, excessive feelings of worry can limit children's abilities to function well at home, school, and amongst friends. If fears and phobias hamper children's daily lives, parents may want to consider seeking the advice of their GP or a mental health professional. Most childhood fears lessen in time, eventually disappearing altogether, but some children require additional time and assistance to work out their complicated emotions. Individual temperament can influence kids' ability to handle stress and change, but when provided with parental reassurance and the tools necessary for coping with the issues in their lives, most children can resume happy, mostly worry-free childhoods.